sometimes i forget how GREAT this movie is. 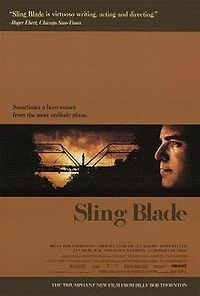 . .
say whatever you will about billy bob thornton, the man was operating at genius levels when he wrote, acted in, and directed slingblade, an incredible masterpiece of southrun storytelling. the soundtrack is nothing to sneeze at either. vaughan: you seem like a thinker ... you know? you seem to always be deep in thought. tell me something, what are you thinking right now? karl: i was thinking i might oughter take some more of these potaters home with me. vaughan: well, how about before that? karl: let me think ... before that, i was thinkin' i could use me another six or eight cans of that potted meat, you got any extry. doyle: believe in the bible, do ya karl? karl: i don't understand all of it, but i reckon i understand a good deal of it. doyle: well, i can't understand none of it. this one begat that one and that one begat this one, and lo and behold someone says some sh*t to someone else ... hey, just how retarded are you? frank childers: i told you i ain't got no boy, now why don't you get on outta here and let me be. you ain't no kin to me. karl: [after a pause] i learned to read some. i read the bible quite a bit. i can't understand all of it, but i reckon i understand a good deal of it. them stories you and mama told me ain't in there. you ought not done that to your boy. i studied on killing you. studied on it quite a bit. but i reckon there ain't no need for it if all you're gonna do is sit there in that chair. you'll be dead soon enough and the world'll be shut of ya. you ought not killed my little brother, he should've had a chance to grow up. he woulda had fun some time. *** here's the million dollar question, and if anyone has a theory, i'd appreciate you letting me know. smockdaddy and i have argued the point and never come to an agreement...as karl says his "goodbyes" to vaughan, linda and frank, they each say "karl?" as he walks away. what is the significance in this? A movie we agree on! And I sobbed at the little worn out hollow in the ground. excellent film. three summa cheers. Genius, I agree. Been too long since I've seen it.... far too long. This page contains a single entry by smockmomma published on July 7, 2009 7:44 PM. yes, mamaT, the smock ate rattlesnake! was the previous entry in this blog.